O, That's Good! 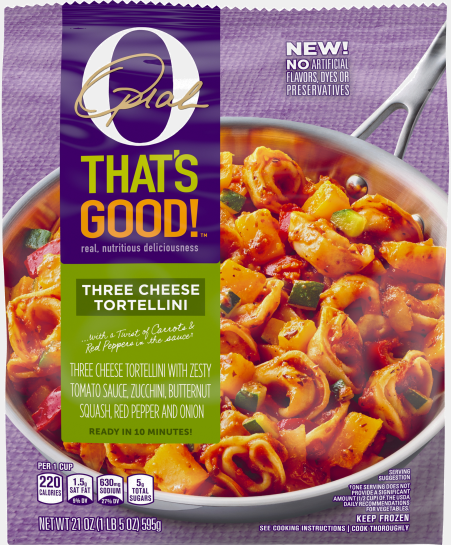 Frozen Skillet Meals, Three Cheese Tortellini, 21 oz | O, That's Good! 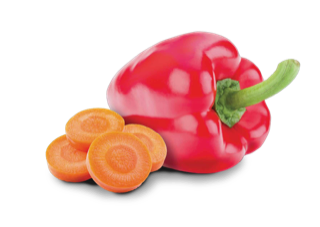 We’ve added a twist of carrots and red pepper to the sauce. COOKED FILLED PASTA (WATER, ENRICHED DURUM FLOUR [DURUM WHEAT FLOUR, NIACIN, FERROUS SULFATE, THIAMINE MONONITRATE, RIBOFLAVIN, FOLIC ACID], RICOTTA CHEESE [PASTEURIZED WHEY, MILK FAT, MILK], BREAD CRUMBS [ENRICHED FLOUR (WHEAT FLOUR, NIACIN, REDUCED IRON, THIAMINE MONONITRATE, RIBOFLAVIN, FOLIC ACID), SUGAR, SOYBEAN OIL, YEAST], EGGS, PARMESAN CHEESE [PASTEURIZED PART-SKIM MILK, CHEESE CULTURES, SALT, ENZYMES], ASIAGO CHEESE [PASTEURIZED MILK, CHEESE CULTURES, SALT, ENZYMES], SALT, SPICES); SAUCE (WATER, TOMATOES IN TOMATO JUICE, TOMATO PASTE, CARROT PUREE, RED PEPPER PUREE, ONIONS, CONTAINS 2 PERCENT OR LESS OF BUTTER [CREAM, SALT], CORN STARCH, CREAM, DRIED GARLIC, DRIED ONION, EXTRA VIRGIN OLIVE OIL, GARLIC, LOCUST BEAN GUM, NATURAL FLAVORS [CONTAINS MUSTARD], PARMESAN CHEESE [PASTEURIZED MILK, CHEESE CULTURES, SALT, ENZYMES], SALT, SPICES, SUGAR, YEAST EXTRACT); ZUCCHINI, SQUASH, ONIONS, RED PEPPERS. O, That’s Good! 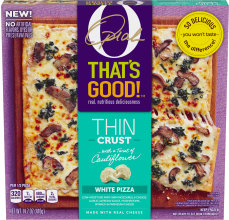 Thin Crust is 33% cauliflower*, 100% delicious! 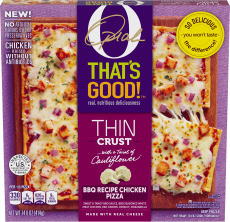 Layered on top of that crispy crust are thoughtful ingredients like antibiotic free chicken. 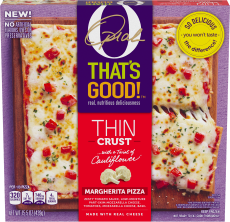 With no artificial preservatives, flavors, or dyes you can enjoy crispy thin crust pizzas a whole lot more. "Everything's better when you share it." © 2019 Mealtime Stories, LLC All rights reserved.